And somehow found time to whip up a skirt for myself. Not to mention hair accessories for me, Z and Z's cousin T who was visiting for the weekend. 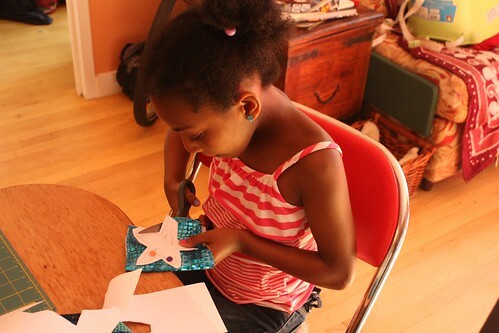 T is nine, so she was actually able to help me--she drew and cut out the stars for the headbands, turned them inside out, and stuffed them, all very carefully. We had so much fun collaborating, and it got me excited for that far-off day when Z can actually be trusted in the sewing area. My original plan was to do the smart thing and serge this super-stretchy stuff with wooly nylon. But if I had had to pull the serger out of the chest and set it up every time I wanted to sew... none of these things would ever have been finished. And I didn't bother overcasting or hemming, but I did reinforce the bottom of the split seam and side opening areas. This quick knit skirt came together in like, an hour, including the cutting. You might even call it a TNT pattern--except last time I made it I was pregnant and cut a larger size. Pattern:BurdaStyle Melissa knit pencil skirt with high-waisted yoke band--no elastic necessary! Seriously, it's just three pieces, and I didn't even bother hemming this one. 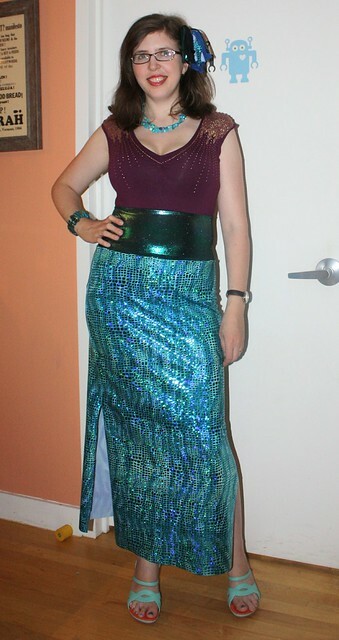 Fabric: Thick, sweaty, glittery fish-scaly spandex from Spandex House for the skirt--I think it was $10/yard. And shimmery metallic spandex in a contrasting color for the yoke/waistband. Alterations: I just made it longer, but only sewed it down to the knee, for ease of walking. Wear to: My daughter's birthday party. Other occasions may be more challenging. Trying to get Z to take this thing off after the party was NOT fun. I started out with this excellent mermaid tutorial from ikatbag (thanks to commenter June for the tip! ), but was worried it would be tough to run around in. 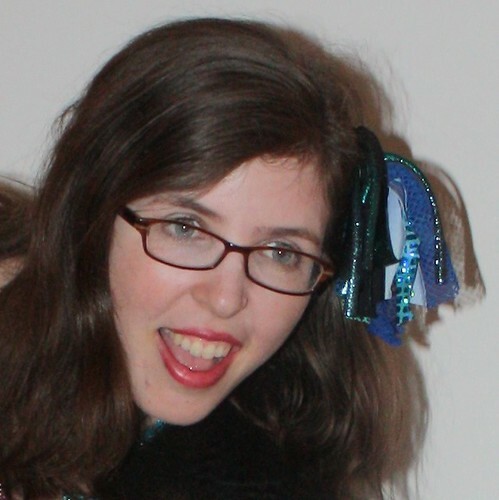 So I tapered the skirt pieces to points, turned them sideways, and added ruffles (see above photo for the latter). The fabric is mostly the same, except I used a sequined net for the side ruffles and a very soft rayon knit from my stash for the waistband to protect Z's sensitive eczema-prone skin from direct metallic spandex contact. This one does have elastic in the waistband--she doesn't have much difference between her waist and hip measurement, so anything that helps keep her clothes up is necessary. These are just a folded strip of the metallic spandex (2" less than the head circumference) sewn into a tube, with a stuffed spandex star handsewn on. DONE. Finally, here's the three of us under the ocean at Z's party. The fabrics and shell trims that didn't make it into our costumes were strewn about the room for ambiance and suchlike--no idea how else I'll use them. So: do you ever sew knits without a serger, even if you have one? Oh, and next up... sewing something, like, wearable. To work and stuff. And a cardigan blocking update! P.S. 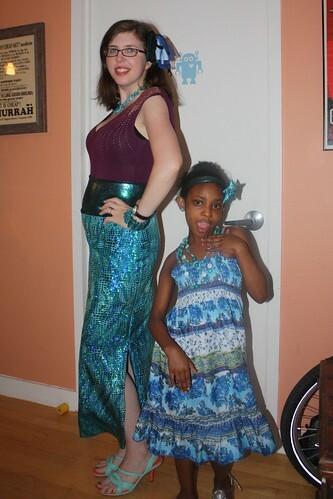 I almost forgot--we weren't the ONLY mermaids at the party! Looks like you all had so much fun - the accessories just make it even better! I always sew knits without a serger, because I don't own a serger! 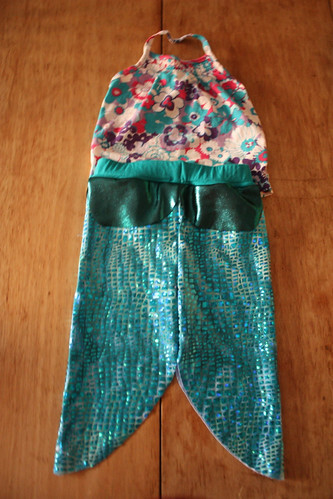 It usually works out OK.
My five year old is peering over my shoulder as I read your blog, upon seeing Z in her mermaid outfit she yelped out "I need a dress like that DESPERATELY!" Sorry you missed the parade, but hope you had a great party. I love the little starfish headbands! And the shape of Z's skirt is a great idea. Z and T are so cute! I actually always sew my knits on my regular machine even though I have a serger. I tried sewing knits on the serger once before I knew you had to change the settings, now I'm a little scared - not of the serger, I use it all the time, just of serger + knit. The key with the serger is playing with the differential feed--I took a serging class to get over my fear and the instructor taught us to play with the feed and then serge a small triangle of fabric to test and ensure there's no ripple on the grain, cross-grain or bias. It works like a charm! Those costumes are super cute! I love any excuse for dressing up, so I love it that you went mermaid right along with your daughter. I don't have a serger, so I've always done my knits with my regular machine and haven't had any problems. I would be scared to sew something so sparkly and sequiny though! The little skirt and starfish headband are just so cute I could die. This brings a whole new meaning to "fishtail skirt". I have seen some questionable mermaid costumes at parties, and your beauties outdo them on every level. Wonderful! OMG - Z is gorgeous in that costume! Excellent work, and lovely pictures, all. You are the best mom ever. I bet she'll want to wear her mermaid dress every day now. Now what in the world can you make with your leftover sparkly nonsense? I recently have started to get the urge to serge (sorry!). I've always said bah to getting a serger before as I sewed everything with my simple sewing machine. But now I can think of some need. I don't have a serger, so I always sew knits on the regular machine; that said, my confidence with knits comes and goes, depending on how recent my last wadder was! Your family is just way too adorable for words. You have one extremely lucky daughter, and you look amazing with that gorgeous sparkly skirt! I don't own a serger, so I salute your non-serged prowess! So cute! Z's outfit is too great--I think you have a knack for costuming. I sometimes get lazy myself and sew without my serger...I prefer it/am addiction-level dependent on it, but there are times when done is done enough, and then my stretch needles and a zigzag are all a girl needs. OMG! Z is so cute it hurts! What an awesome little mermaid! FABULOUS mermaid costumes! Z it too cute for words! I sewed knits on a regular machine in the 1970s, before sergers for the home market were available (they were then known as "merrow" machines -- just as copiers are "xerox" machines, and we play with "ping pong" balls, and fasten our clothing with "zippers"). I've also sewn knits only on a serger. On the whole, I tend to sew seams on regular machine and finish seams with serger, for security and integrity of seams. I just feel more certain that my knit garments will not fall apart as I wear them -- I've had one too many failures in public, alas. OMG ADORABLE!!!! 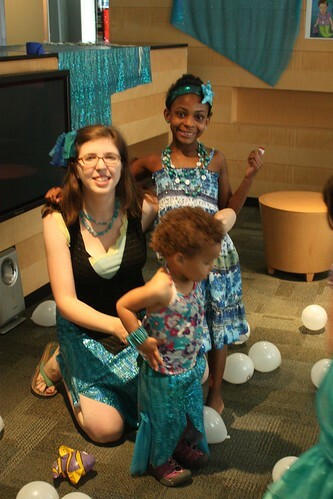 I love all the fabulousness of those mermaid skirts, and those headbands are just delightful! Definitely the most fashionable mermaids that I have ever seen :) If I were Z, I would not have wanted to take off the mermaid skirt either - excellent idea of tapering the points and turning the opening so she could run around!